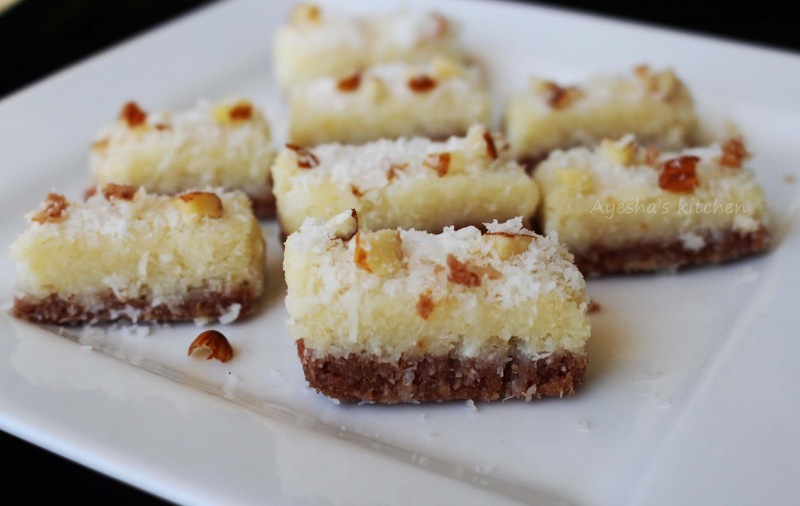 Coconut burfi is named as Beginners burfi because it is very easy to make without any fail. Burfi is one the simplest sweet recipes for any festive seasons. The main ingredients of simple burfi includes condensed milk and sugar. Traditional coconut burfi is made with 4 ingredients like grated coconut, condensed milk or sugar, milk and ghee. Now a days you can see lots of varieties in this sweet like pista burfi, kaju burfi, besan burfi etc..All tastes wonderful. Chocolates and cakes reminds me of Christmas. Desserts and puddings reminds me of Eid. Like so, burfi and fudge reminds me of the festival of lights "Diwali". Am i right, friends? 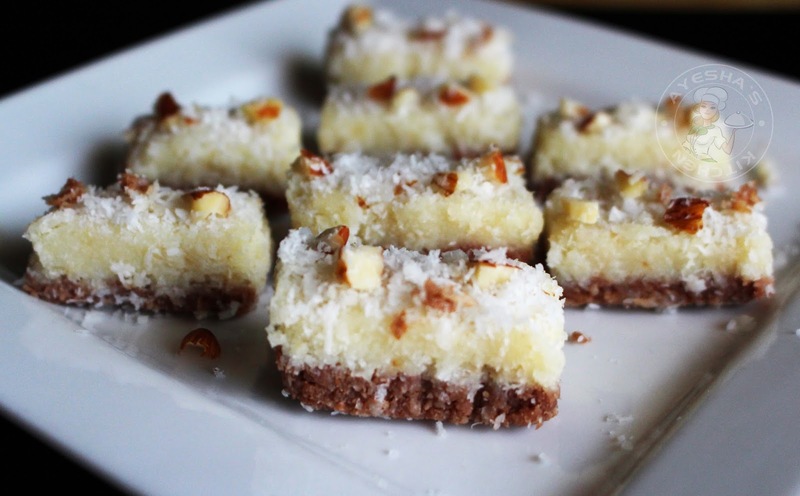 Yes, we do...This coconut burfi is soft, chewy, crunchy and a twist with nutella too. Iam not a sweet lover or chocolate lover. But except for Nutella spread. Nutella is my lifeblood. No matter how we using this chocolate spread, it has the power to cheers us up when we are moody. A simple spread on toast is enough for me. Really, am thankful to the Italian company Ferraro for this lovely chocolate Hazelnut spread. 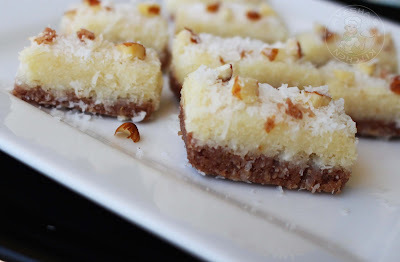 Here in this recipe of coconut burfi, i made a layer with nutella that gives a drool and worthy texture. No one dislikes coconut sweets especially the one which is made with desiccated coconut. And for those chocolate lovers, i made a chocolate burfi layer with nutella. So lets see how to make barfi /coconut barfi /sweet coconut recipe /two layered coconut burfi /simple sweet recipes / kids sweets/ easy sweets / easy treat to make / quick nutella recipes. Do try this two layer coconut burfi recipe and enjoy. Prepare a greased square tray ready. Set it aside. Add milk, desiccated coconut, milk powder, sweetened condensed milk (milkmaid, you can add more as per your sweet preference) in a pan. Combine them well and switch on the flame now and make the flame to medium low. Stirring continuously until it become thick consistency. Now add ghee and combine very well until it leaves from the sides of the pan. When done, switch off the flame and transfer half of this coconut mixture to a plate. Now again switch on the flame to very low and add nutella to the remaining coconut mixture in the pan. Mix well until the mixture turns a chocolaty texture. When done, off the flame. Transfer the chocolate mixture to a plate and combine well with hands and make a smooth soft dough. Add this chocolate dough into the greased tray and spread it evenly with the back of a spoon. Now like so, combine the coconut mixture with your hands well and make a smooth soft dough. Layer it over the chocolate mixture gently. Top it with desiccated coconut, some chopped nuts and press gently . Refrigerate it for 4 hours or over night. It tastes awesome the next day as the desiccated coconut soak well in the condensed milk and nutella mixture. Cut into desired shapes and serve chill.